Curator Lindon Barrett presents Voices in Black Canadian Narratives, an exhibition honouring the work of artists Joan Butterfield, Nicole Alexander, and Ian P. Grant. Each artist brings their own distinct voice to the fabric of Canadian stories and histories. Voices in Black Canadian Narratives is presented in collaboration with the Halton Black History Awareness Society (HBHAS) and the Afro Canadian Caribbean Association (ACCA). The Halton Black History Awareness Society (HBHAS) is preparing for its third year of inclusivity events focusing on supporting the implementation of cultural history into the educational curriculum and public mind-set, and celebrating Canadian Black History contributors, cultures and community integration. Celebrate Halton's cultural history through dance, art, music, spoken word, historical literature, theatre and information/educational forums and workshops. We are intent to support Halton's potential in being a Cultural Capital within Canada. It is the vision of the Halton Black History Awareness Society (HBHAS) to celebrate Halton's diverse cultures through Cultural Education, Cultural Enhancement and Cultural Entertainment. All venues will be open to the public and promote inclusivity. We will be also collaborating with a number of community partners in presentations and workshops within schools and community centers throughout the year towards the implementation of cultural history into our educational systems. See below for vendors' opportunities. Saturday, August 3, 2019 - Spencer Smith Park, Burlington, Ontario. 12 Noon – 11 p.m. 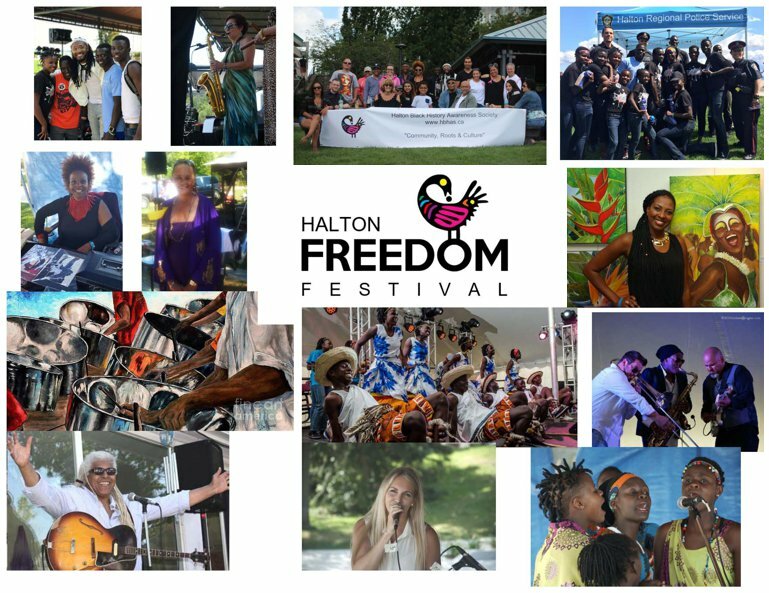 The Halton Freedom Celebration Festival brings together musical acts, children's and youth activities, cultural art, food, crafts; heritage, historical, and genealogical vendors promoting inclusivity and community integration. Our 2018 Festival attracted a 300% increase in visitors. This is your opportunity to join our growing celebration. We welcome you and yours!!! Interested parties please Click Here to download the 2019 Vendor Application (pdf). Please ... help fund this worthy project with a donation!